World's smallest, Window based, pocket / pouch PC, adaptable to your project. Powerful, tough & flexible, 7"-20" screen, Adaptable to your project. IP-67 LAN switches, Routers, Wireless LAN to fiber /RS232 /485 /Analog /Digital converters. 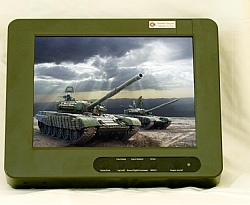 4"-20" LCD Screens, Rack mount or NEMA mounting, For Land, Air, naval & Vehicle Applications. Build a system for a mission from a selection of building blocks: CPU, LAN switch, Screen, Video, wireless, etc. Powerful, tough & flexible, with 13-20" screen, Adaptable to your project. 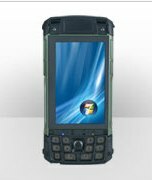 The new Handheld is Fully MIL-STD Certified, It Has Atom CPU running Window, up to 8 hour Battery and Sunlight readable 5” Touch screen. Weighting only 800gr It is an amazing Hand held PC, the device has been tested and approved by dozens of defense industry projects. for the military, Homeland Security, and industrial markets. May contact “zeev” at 098351166 And order a demo unit. Mediatek Rugged Computer Systems is part of the privately-held Mediatek Group, established in 1984. Company has over twenty years of experience in providing Industry with Computers and Peripherals. Over the Years Mediatek has become synonymous with quality, reliability and integrity. In 2000, following almost a decade of strong growth, the Mediatek Group launched its Rugged Computer Systems subsidiary. This group built on Mediateks Group experience in Commercial computing to offer the Market robust, MIL-STD-compliant computer, communications and Power Systems for a wide range of applications in the military as well as the defense Industries . Mediatek Rugged Group Sale and Technical personnel, Have years of experience in Offering customers optimized computing solutions that can fill the requirments for rugged equipment in Military projects. לקוח וותיק של מדיאטק מזה שנים, החברה משווקת מחשבי לוח ומסכים מתוצרתנו כשו"ב למרגמות המיוצרות עיי החברה .